Tens of thousands of acres in Stephens and Palo Pinto counties are on fire in the worst wildfire season in Texas history. Gov. Rick Perry is asking President Barack Obama for federal disaster assistance for 252 out of the state's 254 counties. 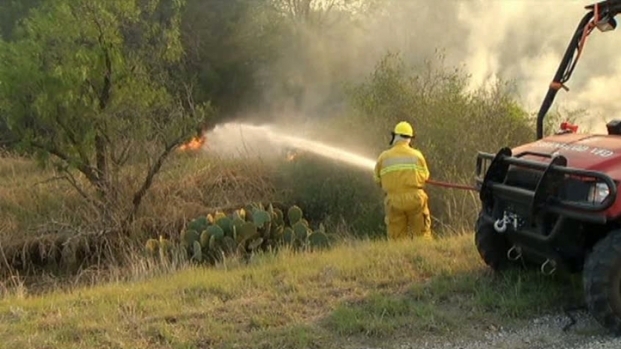 The Texas Forest Service said four fires are burning near and to the south of Possum Kingdom Lake. Law enforcement officials went door-to-door Sunday, notifying residents of a mandatory evacuation order that was lifted later Sunday. All roads leading into the town of Strawn were closed at 2:15 p.m. Many evacuated residents went to the neighboring town of Gordon, about eight miles east of Strawn. The town of Gordon opened up a school for evacuees. The three fires, the Possum Kingdom West Fire, the Hohertz fire and the Possum Kingdom East Fire, combined into what the Texas Forest Service called a "fire complex" that has burned more than 55,000 acres as of Sunday night and counting. Three Fires Combine Into "Fire Complex"
The Possum Kingdom West Fire, the Hohertz fire and the Possum Kingdom East Fire, combined into what the Texas Forest Service called a "fire complex" that has burned more than 55,000 acres as of Sunday night. An Incident Command Post was established along Highway 16 in Strawn, less than two miles from the looming fire. "If the wind should shift and change direction, it could be in town in a matter of minutes," said David Nicklas, Palo Pinto County Judge. "We are ready to pack up and move now, and we can be out of here in literally minutes," said Trooper Dubb Gillium Department of Public Safety Highway Patrol spokesman. More than 60 agencies are helping contain the fire. The Texas Forest Service committed two air attacks, three heavy helitankers, two Blackhawk helicopters, three 20-person hand crews, three task forces of dozers and engines and more. Dozens of volunteer fire departments have been fighting the fire nonstop for days. A rancher who wanted to remain anonymous used a borrowed water truck to spray various parts of his 11,000-acre ranch. A large part of his ranch was charred, but his efforts helped some. "We've been able to keep some of it from spreading and prevent it from going to other pastures," he said. The evacuation order for Strawn residents were eventually lifted, but it remains to be seen when firefighters will get a grip on the blaze. "We don't know," Gilliam said. "It depends on Mother Nature -- is she going to help us or is she going to hurt us with the winds and the humidity? And we've got firefighters that are obviously exhausted. They've been out here for days fighting it." The three major fires near Possum Kingdom Lake have burned more than 55,000 acres, the forest service said Sunday night. The fires were 10 percent contained as of Sunday night. The fires destroyed at least 32 homes and one church as of Sunday night, as well as an estimated 90 head of cattle. 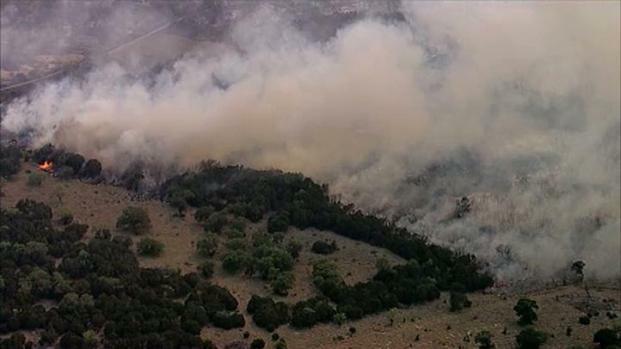 Another fire burning in the area is a 1,000-acre fire could have been sparked by the original Possum Kingdom Lake fire. Strawn was evacuated Sunday afternoon. The community of Caddo was also evacuated Sunday afternoon because of the fourth blaze, an estimated 2,270-acre fire in Stephens County. That fire is 50 percent contained, the forest service said Sunday night. Strong winds and drought-stricken grasses and shrubs have fueled fires across the state. Crews hoped to gain ground on the North Texas fires Saturday, but stiff winds Sunday were pretty stiff caused fires to jump lines that had already been dug. Wildfires have spread across more than 1.5 million acres in the past week. About half a dozen massive fires are still burning. The governor is asking that nearly all of the state's counties be declared a major disaster. 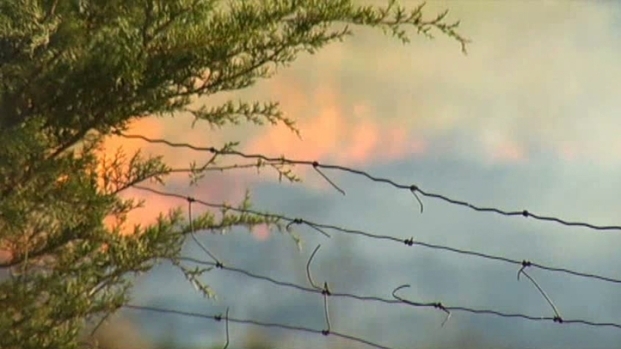 Perry's letter says wildfires are striking or threatening all but two of Texas' 254 counties. "The wildland fire risk potential has reached a critically high level within the state due to the current threats of wildland fuels, critical fire weather and fire occurrence," his letter said. "A combination of higher than normal temperatures, low precipitation and low relative humidity has caused extreme fire danger over most of the state." Perry's letter says that an above-normal level of grasses developed from last summer's rains have cured in winter temperatures and are now fuel for wildfires. A "major disaster declaration" would make the state eligible for help in responding to and recovering from the emergency. Authorities said a homeless man was arrested late Sunday in the Austin fire, charged with reckless endangerment after starting a campfire in hazardous conditions. The southwest Austin fire was being blamed for destroying at least eight homes and damaging as many as 10 others. The man was being held on $50,000 bond, said Austin Fire Department spokesman Chayer Smith. The fire burned 30 to 40 acres in the Oak Hill section of the capital city before state helicopters lifting large buckets filled from nearby lakes dropped water on burning grass and homes. Two four-engine C-130 aircraft later joined the effort, and the once-dense column of black smoke had lessened significantly as the contained fire burned close to the ground. Nearby major roads were reopened. Austin Mayor Lee Leffingwell said the fire is contained but not yet under control. Fire Chief Rhoda Kerr said the conditions are still extremely favorable for more fires to occur, because it's so dry and windy. Fire Department spokeswoman Dawn Clopton said residents of about 200 homes were asked to evacuate. Many residents fled their homes -- but not before turning on their lawn sprinklers. Laurence Page stood on a street corner, trying to help police figure a way to reach and carry to safety his asthmatic elderly grandmother without endangering themselves. Lindsey Senn fled her house after hearing neighbors banging on doors and shouting warnings to flee. The 22-year-old said she looked out her door, saw smoke everywhere, grabbed her pets and fled in her car. "Am I going to come home to a house? ... A lot of thoughts are going through my head right now," Senn said.